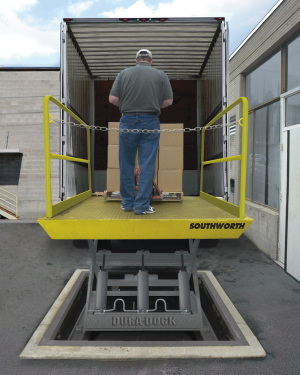 Southworth Products Corp’s Dura-Dock Series loading dock lifts transfer loads quickly and safely from any truck bed to any dock height, and vice versa, without ramps or inclines, the company says. The lifts have corrosion-resistant, galvanized base and legs and can come in 5,000-lb. and 6,000-lb. capacities. Galvanized construction is optional for capacities of up to 20,000 lbs. The standard features include a diamond-tread, steel platform with beveled toe-guards, a weatherproof pushbutton NEMA-4X control, removable steel handrails with mid-rails and steel pins operating in self-lubricated bearings at all pivot points.